I’ll let you in on a little secret: I don’t really love Super Friends. It’s not like I actively dislike it or anything and I know it sounds heretical to anyone who, like me, grew up in the ’70s. 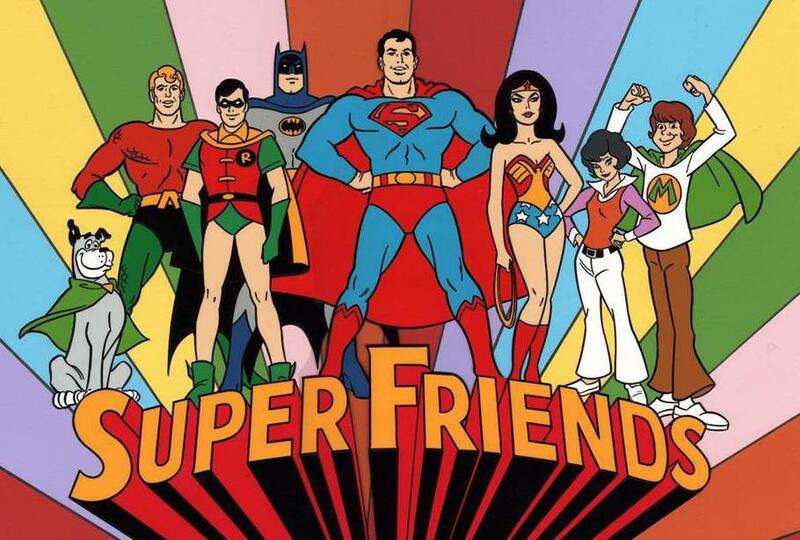 Though I dug the whole Legion of Doom schtick, Super Friends was a staple mostly because it was often the only superhero game in town on Saturday mornings. Filmation? That’s another thing entirely. 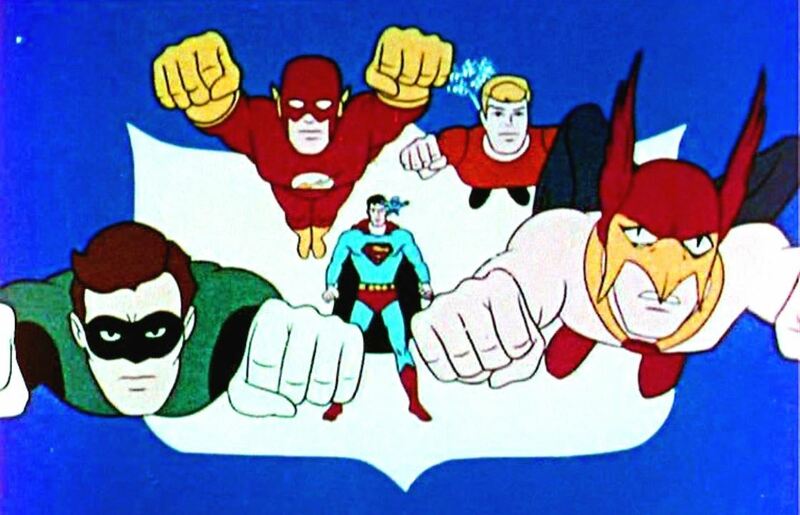 I love Filmation’s DC Comics cartoons from the ’60s, which I discovered through the magic of syndication. 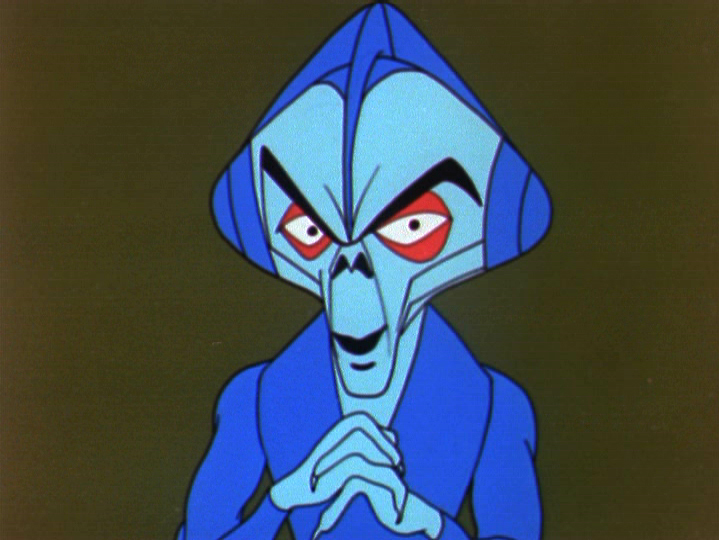 Part of it is because Filmation’s cartoons are unapologetically schlocky in a way that Super Friends isn’t. Super Friends, with its contrived teenage interlopers, derivative animal sidekicks and “Health” segments, feels more annoyingly earnest. Even the name “Super Friends” is condescending. 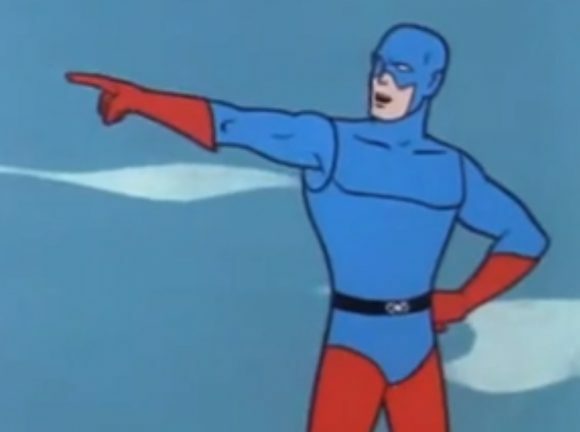 Filmation had no such pretentions: They’re adventure cartoons starring my favorite superheroes, done on the cheap, cheesy in the best possible way. Why am I mentioning all this now? Simple: The big-screen Justice League is out next week (11/17, officially) and I can’t help but think back to the first time the League banded together on screen — in three shorts produced in 1967 as part of the Superman-Aquaman Hour of Adventure. Quick bit of background for the uninitiated: Filmation struck it big with its Saturday morning The New Adventures of Superman cartoon in 1966 — a good year for TV superheroes — on CBS. The next year, they expanded with Aquaman cartoons, which may be the best Filmation ever produced. But they also added a series of “guest-star” shorts featuring solo adventures of the Atom, Flash, Green Lantern and Hawkman, and two teams: the Teen Titans and the Justice League of America. Each got three shorts apiece. Summarily executed by the Man of Steel. Anyway, there’s no Despero, Kanjar Ro or Felix Faust, y’know what I mean? So it’s a somewhat truncated team, but that’s cool. It was pretty typical in those days for JLA comics to feature subsets of the crew (hence the famed “Roll Call” features on the comics’ splash pages). Overall, however, the heroes are fairly interchangeable, other than their power sets and often off-model costumes: GL, Atom and Flash all add to the cartoons’ kitsch value with their humorously skewed designs. But it doesn’t really matter. These 5-minute shorts don’t pretend to be episodes of Justice League Unlimited, the high-water mark of all superhero animation. They’re good old-fashioned bash-’em-ups that are as complicated as a backyard game of tag. And I love them for it. — Check Out THE WORLD’S GREATEST SUPER FRIENDS PODCAST. Click here. — 13 QUICK THOUGHTS: The Kitschy Kick of FILMATION BATMAN. Click here. I loved the Filmation JLA cartoons! George Kashdan who was a prolific DC Silver Age editor whose titles included editing the silver age Aquaman and Teen Titans series wrote most of the Filmation JLA & solo JLA (Green Lantern, the Atom, etc.) scripts. I think “Between 2 Armies” had a very progressive storyline (white aliens fighting black aliens – very 60s, civil rights influenced). The animation produced for the Flash running forward and backwards and then forward again in “Target Earth” is just awesome! 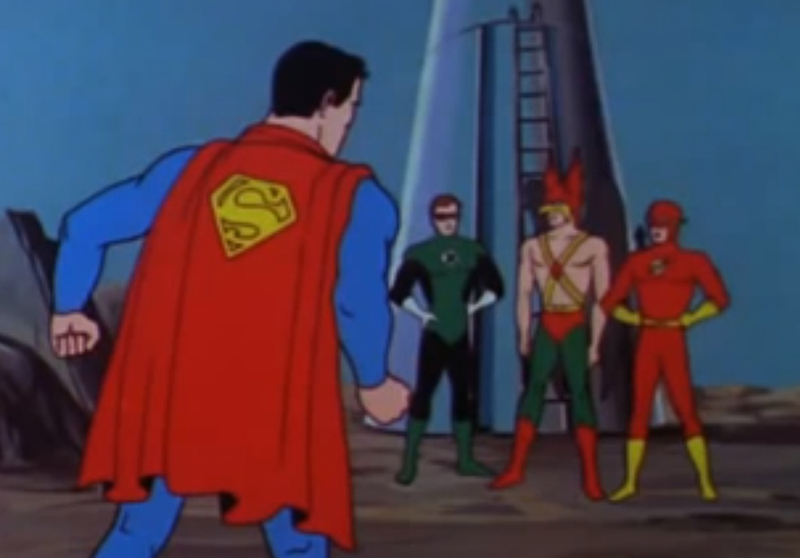 Regarding the costume changes, my theory is that DC had to sign off on the costume changes since DC owned the series while Filmation was the co-producer/studio and never retained the rights for the series. Some of the costume changes were cool. I though Aquaman’s boots were a nice touch, but at the same time, I wished they had added the stars to Wonder Girl’s shorts. I have to respectfully agree to disagree with you, good sir. While the rest of the solo segments were light-years ahead of the Super Friends, most especially the Teen Titans, the JLA segments were generic and interchangeable and therefore the weakest of all the segments. The first two segments are virtually identical (Both alien invasions threatening earth!) and the third segment, while it has an interesting premise, has Superman woefully out-of-character and not just with him killing the villain in the end. It just feels so out of character to hear Superman say “Does anyone know the name of the joker who called us here?” in the beginning of the story. I’m not at all comfortable with Superman sounding like a 1940’s film noir tough guy private-eye, ala Humphery Bogart. Was Super Friends Earnest and preachy? Yes, it was, very much so. However the characterizations were pitch perfect, especially Superman. Also Danny Dark’s voice as Superman was the warmest, most compassionate voice since the glory days of George Reeves. The normally superb Bud Collyer sounds too tough and harsh in that segment. Still it’s an interesting rough first draft of the JLA, that would be perfected in Justice League and Justice League Unlimited! I respectfully agree with some of your points but still stand firm on my opinion regarding Filmation’s Justice League. I agree that Danny Dark was an impeccable choice to play the man of steel in the Super Friends series. However, up until Hanna-Barbera took over the DC Franchise, Bud Collyer had a long association with the Superman character. Collyer along with Joan Alexander was hired to play Superman/Clark Kent and Lois Lane respectfully by Allen Ducovny who worked with both actors on the Superman radio series, and at the time, was the executive producer of the trilogy (The New Adventures of Superman, The Superman/Aquaman Hour of Adventure and the Batman/Superman Hour). Ducovny worked for DC, not Filmation and any creative changes for those series had to go through Ducovny. I agree that Superman killing the villain (which by the way was written by Dennis Marks, one of the few non-DC writers working on the series), should never happen ever! The New Adventures of Superman does play homage to the George Reeves version with a similar series open and the animated appearance of Inspector Henderson. As a kid, I got a kick watching Superman act like a boss on occasion (which I agree was not the normal depiction of Superman, but not a deal breaker for me). While both “Target Earth” and “The War between 2 Armies” have an alien presence storyline, The War Between 2 Armies is about two armies who are at war with each other and who have decided to take their conflict to Earth. Each side, in separate scenes, explain to the Justice League that their conflict has nothing to do with the Justice League, Earth or invasion. By the way, Target Earth has some of the best animation direction of the series. The director’s Hall Sutherland and Anatole Krisonoff (a veteran Warner Bros. animator) allowed the camera to do all the heavy lifting in that cartoon which gave the cartoon the illusion of more action. In one of the scenes when the Atom destroys the alien technology, the camera slowly pulls back at an angle to give the scene a much more dramatic effect. A similar camera technique is used in the movie, The Thing from Another World” when the air force gathers together for their final showdown. My favorite Super Friends series is the Challenge of the Super Friends! I love the origin story that featured Superman, Wonder Woman and Green Lantern as well as the last episode which shows how close the Legion of Doom came to destroying world. This is an awesome, respectful debate. The way it should be. Thanks for weighing in, guys! Feel free to keep going. 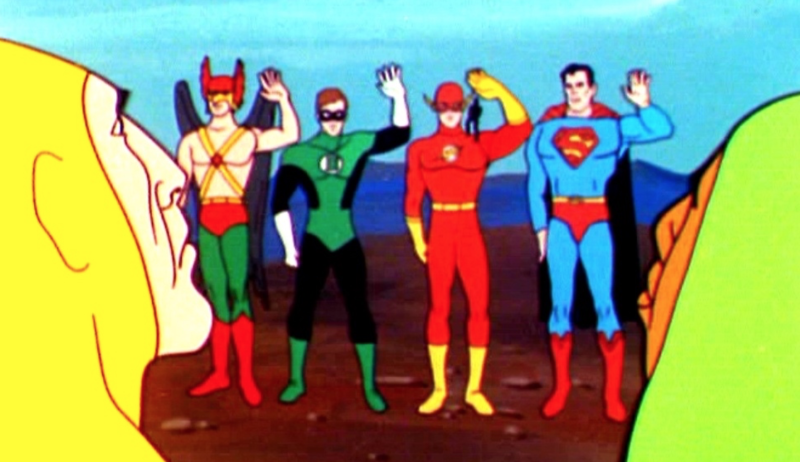 Nice post on Filmation’s version of the JLA.